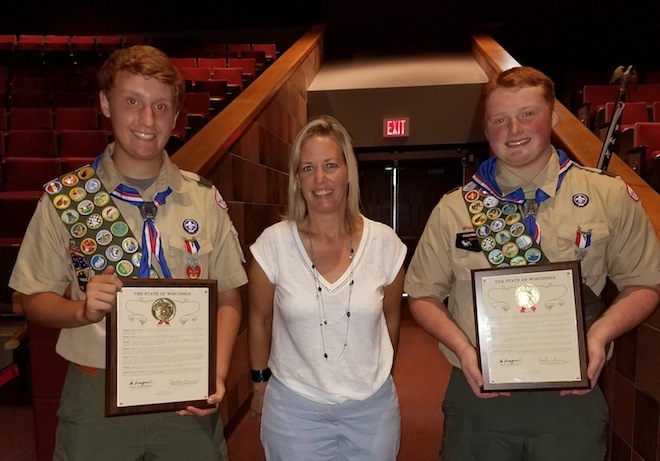 Two members of Boy Scout Troop 380 recently achieved the organization’s highest rank of “Eagle Scout” and were recognized at a July 14 Court of Honor ceremony at Wilmot Union High School. 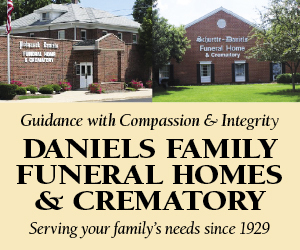 The members, Daniel Mark Porter, son of Mark and Theresa, of Twin Lakes and Austin Robert Schwarz, son of Joseph and Tammy Schwarz, of Genoa City were presented with certificates, pins and ties as part of the ceremony. The two were each presented with a proclamation by State Rep. Samantha Kerkman. Also in attendance presenting awards were Paul Martinez, American Legion Post 544 Past Post Commander; Jon Shelenske, Fox River Executive Director; Joseph Schwarz, Scout Master of Boy Scout Troop 380; Mike Burke, Assistant Scoutmaster; Bill Sherry, Fox River District Unit Commissioner and National Eagle Scout Association (NESA) Honor Guard Representative.